It seems that the word to best describe the beginning of 2011 would be division. Political unrest in the Middle East coupled with state governments making difficult decisions has brought a wave of divisiveness into the lives of many. Discussion and debate are not bad things; conflict is a healthy and necessary part of learning and progress. But a conflict where winners are celebrated at the expense of those who have lost leaves us in a far different and more dangerous place. As a country, we’ve gone that route before – The Civil War. Please understand that I am not suggesting that we are on the brink of revolution, but by looking back at our history and at the words of Christ, I think a valuable lesson can be learned. The major goal for President Lincoln throughout the war was to maintain and reestablish the unity of the nation. 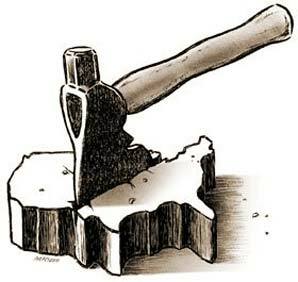 Lincoln wanted nothing more than to gain back the half of the country that had seceded from the union. His second goal was to keep unity among the states that remained in the union. So Lincoln understood the importance of unity. Where did he gain this insight? Perhaps it was impressed upon him by the election that landed him in this crisis in the first place. The major reason the history books tell about President Abraham Lincoln and not President Stephen Douglas was because of a lack of unity among the Democratic Party. In the election of 1860, the Democrats divided their party among three candidates: Douglas, John Breckenridge, and John Bell. With their vote split, the Republican candidate from Illinois was able to claim victory: A united Republican Party defeated the divided Democrats. Unity is essential to any organization. The lack of unity will fracture any group or organization. When the husband and the wife are not united, the family suffers. When the players and the coaches are not united, the team is defeated. When the workers and the managers are not united, the business loses money. So when the body of Christ is not united, what do you think that result will be? Jesus points out to the Pharisees the illogical nature of their claims. “If Satan drives out Satan, he is divided against himself. How then can his kingdom stand?” But if this is true, why then do we as a body of believers convince ourselves that we can live in relative peace and harmony as a church even when we stand in opposition to one another? There is no benefit earned by disharmony. There is nothing gained by factions. The only winner in this situation is Satan. He has been given the greatest gift he can receive – a body of believers who need no special attention on his part because they have divided themselves into inactivity and ineffectiveness. So how does a body of believers come back to a place of harmony after living in division? They must find commonality in the one thing that is greater than any personal issues that have created the splits of the past. That one unifying element is Christ: His words, life, death and resurrection. Matthew 6:33 implores us to seek first the Kingdom of God. Not later, not after checking our other options, not when it is best suited to meet our needs, but first. If the action aligns with God’s Word, do it. If not, then don’t. So if what this says is true, does that mean that we should find a Biblical basis for the things we do? Yes. So if it does not root itself in the Word of God and we cannot connect it into the will of God for His church, we should avoid doing it, even if many of us think that it’s fun? Yes. Isn’t that closed minded and lacking a vision of the big picture? No. We are a church after all. I am not suggesting that we only allow the perfect into the church (attendance would drop drastically). But as a body of believers here on earth, we will do amazing things in the name of Jesus Christ when we aspire to become aligned with the will of God. May God continue to bless us now and always as we seek His will to solve our ills by the power of His glorious name. This entry was posted in Devotional and tagged A Mile in My Schu's, Abraham Lincoln, Bible, Choices, Christian Life, Christianity, Civil War, Day 1 of 1, Devotion, Devotional, Devotionals, devotions, Division, God, God's Plan, God's Promises, God's Word, Indecision in Division, Jesus Christ, Matthew 12:22-32, Matthew 6:33, Overcoming, Religion, Richard Schumacher, Stephen Douglas, Unity. Bookmark the permalink.